Well fam, we have made it to our final stop on cultural routes: Rome. First of all, I am thrilled; Rome holds so much history, culture, and shopping. What’s not to love? But secondly, I am struck dumb by all that has led up to where we are now. It’s crazy to think back to first arriving in Berlin nearly a month ago now because so much has changed. “Caroline, you better not go off on CR and change,” friends said before I left on this trip. Why do we fear change so much? I am guilty of this as well. I HATE change. I don’t know how to process it, handle it, or move forward from it because it’s new and scary, but if I’ve learned one thing this past year, it’s that change is inevitable but not necessarily bad. One chapter of life closes only to open a brand new, terrifying, exciting adventure. Rome is the prime example of change. Today, we walked around with Olga, who may be my new favorite person ever. She is knowledgable, hilarious, relatable, witty, and just overall an amazing tour guide and human being. Olga took us on quite a tour today. The first big stop was the Colosseum. Wow! It is truly colossal. Walking around, my head was swirling with questions. How did they build this? How many people died here? Why was this incredible structure pillaged so terribly? How did the shows work? Etc. To take that place in and then to get to go down to where they kept the animals and where slaves worked behind the scenes (thank you Dr. Pitcock!) blew my mind. What is craziest about the Colosseum to me is 1. It only took between six and eight years to build. 2. It was only actually used for a short period of time before it became a quarry and later a sacred Christian site- not exactly what it was originally intended for. Looking at it now, it is amazing, but it is hard to imagine it in all its glory centuries ago. Time has a funny way of changing and distorting things. 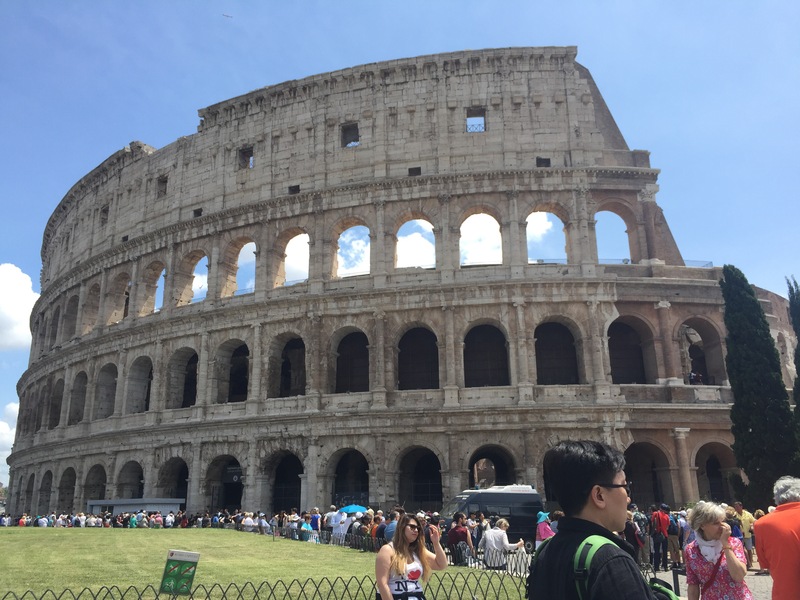 The Colosseum is just a huge example of time making its mark- aging it and changing it. A bit later, we walked through the Roman forum. In my mind, this was ground zero for change. 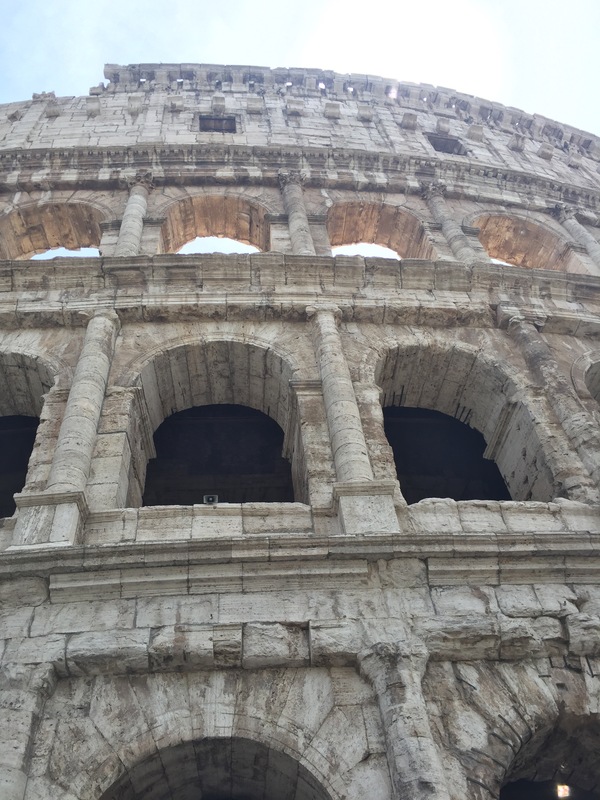 Walking through, Ancient Rome was juxtaposed with the Middle Ages and the Modern Era. Often one site was built on the strong foundations of another. Olga said, “Rome is like historical lasagna. There are so many layers.” To me, that is what made this tour amazing. Did the people even realize the history they were building upon? As we walked there were countless examples of the layering of history, culture, and architecture displayed. Now how does this relate to people? As we were walking around today, I was thinking about how the 13 other students, Dr. Pitcock, and Robyn are like lasagna too. When we first arrived in Berlin, our conversations were the typical “What’s your major? Tell me about your hometown and family.” Etc. Twenty days later, we are really getting to the “meat” of each other. We know what makes others annoyed, happy, sad, excited, and what’s cool is that, like excavating Rome, there is always more to find. So yes, things have changed. Gone is the chapter of my life without these wonderful 15 people, but honestly, I’m glad that chapter is gone because I love these people to death, and I cannot wait for the last few days to explore more of Rome and these awesome friends.